The front passenger's seatback should be tilted to enter the rear seat. By pulling up on the recliner control lever (1) at the outside of the front passenger's seat, the seatback will tilt forward and the seat will automatically slide forward. 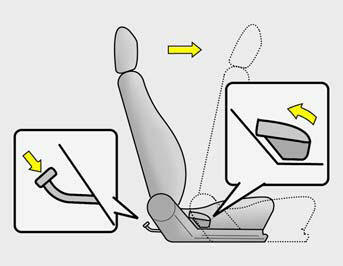 Rear seat occupants can tilt the front passenger's seatback by depressing the foot lever (2) as shown in the illustration. Passengers sitting in the rear seat should be careful not to accidentally press the foot lever (2) while the vehicle is moving, as this may cause the seatback to move forward and injure a front seat occupant.